- Calls for the herbal high khat to be banned in the UK have been renewed days before a government report into its usage is due to be published. On 5 January the Netherlands became the latest country to outlaw the plant which acts as a stimulant when chewed. Campaigners said it causes medical problems and family breakdowns. The Advisory Council for the Misuse of Drugs is to release a report next week into whether khat - grown in East Africa - should be banned in the UK. Khat, which is particularly popular among some in the Somali, Ethiopian and Yemeni communities, has already been outlawed in most European countries as well as in the US and Canada. Users of khat say it makes them more talkative and relaxed but potential side effects are thought to include insomnia, depression and mouth cancer. Some members of the British-Somali community have been calling for years for khat to be made illegal. 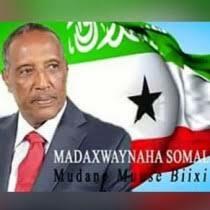 Abukar Awale, a former khat addict who now campaigns against it, said: "Khat is destroying our community. "Somali women are suffering domestic violence as a result of their husbands' use of khat, a lot of young boys are using khat now, they are failing at school and turning to crimes. "Khat has become the biggest barrier to integration for the Somali community." A woman, who did not want to be identified, also supports a ban. She said her brother has chewed khat and now suffers from schizophrenia which she blames on his use of the stimulant. "He went from being someone who was very lively and funny, to being very moody, aggressive and closed off." With direct flights arriving from Kenya four times a week, London has become a major hub for khat importation and distribution. From the capital it is distributed across Britain and it is also believed to be smuggled from the UK into Scandinavia and North America. According to a report for the Home Office, more than 3,000 tonnes of khat were brought into Britain in 2010. Mohamud Ahmed Mohamed runs a legitimate warehouse in Southall in west London from where he delivers khat across the capital and the UK. "Roughly I get 3,000 cartons (of khat) per week. I deliver to the whole of the UK - Manchester, Sheffield, Leeds up to Glasgow." In 2005 the Advisory Council for the Misuse of Drugs (ACMD) said "the evidence of harm resulting from khat use is not sufficient to recommend its control," and there was "no evidence of its spread to the general population". But in 2008 Baroness Warsi wrote an article in the Guardian promising to make khat an illegal drug if the Conservatives came into power. Now the ACMD is due to release a report which could recommend it be banned. 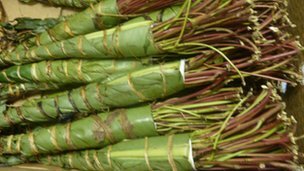 But traders say a ban would not mean an end to khat in the UK as, according to them, smuggled khat is still widely available in Europe and the US, although it is more expensive. They say in London a bundle of the plant costs about £3 while in the Netherlands it is now about £15 and the US it can cost more than £40. Dr Axel Klein specialises in the study of addictive behaviour at the University of Kent. He says there was no clear medical evidence that khat is harmful and believes a ban could be counter-productive. "It will create more tensions between young Somali men and the police if they are stopped and searched for khat and it is providing organised crime groups with a major opportunity to raise revenue through smuggling. The consequences of a ban far outweigh any possible dangers of excessive use."